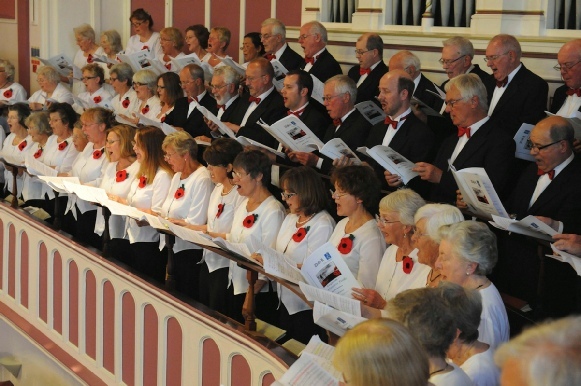 Requiem - In Flanders Fields by Derek Lawrence performed by the Jersey Festival Choir and Orchestra with guest conductor David Lawrence (no relation to Derek!) and soloist Oliver Sammons (baritone). 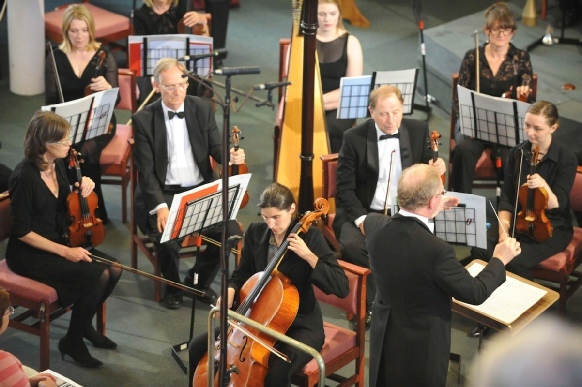 After the interval the choir and orchestra joined together again for the moving 'Requiem' by John Rutter with Jersey soprano Gabriella Cassidy as soloist. Reflecting after the concert, it was felt that 'In Flanders Fields' was a very moving piece, enjoyed enormously by the audience as was the Rutter, 'Requiem'. The members of the Midlands Hospitals Choir augmented our numbers well and thoroughly enjoyed their time with us and in the island. The choir looked wonderful, especially the ladies with poppies made generously for us by the Jersey East Section of the Catholic Womens League of England and Wales. A big thank you to Jeanette Collins was given for co-ordinating this. Thanks were also given to Marnie and Catherine and 'backup team" for the organisation of the After Show party. Finally a huge thank you was reserved for Elizabeth, Sue and David for guiding us to our wonderful performance, along with Grace our able accompanist.